The Welsh Campaign held their 2nd annual football charity match closing the Fortnight of Action 2013 at Taffs Well FC, which was sponsored again by Thompsons Solicitors. The Legends took on the Football Association of Wales select team for a 2nd consecutive year hoping to overturn last season’s 3-2 loss to the FAW. The Sporting Legends team saw the return of many of last season’s players who were out for revenge for last season’s loss. These included Andy Legg, Scott Young, Nathan Brew, Andy Gorman, Jason Trindler, Steve Jenkins and Christian Roberts. New additions to this seasons Legends team was Kevin Cooper, Julian Alsop, Lee Jarvis, Andy Hammett, Nathan Palmer, Aron Davies, Tom Ramasut, Leon Jeanne and Lee Trundle who captained the team. Prior to the match Andy Legg and Lee Trundle made the draw for the FAW Word Cup Semi Finals. Over 140 people attended the match and young people took the chance to win some great prizes in the Family Activity Village. Games included Hook-A-Duck, Tin Can Alley, Football Keep-Up Challenge, Guess the Teddy Bears Name and Guess the Number of Sweets in a Jar. The village was supported by Game On Wales. At Half Time Legends team captain Lee Trundle was awarded a SRtRC Hall of Fame award by Campaign Manager Sunil Patel for his support to the campaign in recent years. The half time period also saw a penalty shoot-out competition with 4 young people from the crowd up against Legends keeper Jason Trindler. The winner was Sunny from Cardiff who won a pair of tickets for an upcoming Wales match at the Cardiff City Stadium. The Sporting Legends were the overall winners on the night in a 4-2 victory. Goals were scored by Lee Jarvis, Julian Alsop and a brace from Captain Lee Trundle. FAW scorers were Daniel Gwyn Hughes and Morgan Williams. Trundle was the man of the match on the night and was presented the SRtRC Sporting Legends Charity Match Trophy after the game by Campaign Worker Jason Webber. The match was covered by the BBC and S4C and will feature on Sgorio tonight (28/10/13). SRtRC would like to thank Thompsons Solicitors for sponsoring the match, Taffs Well FC for hosting the event, everyone who came to support the match, the players and volunteers along with the FAW for making the match possible again this season. The Sporting Legends Charity Match will return next season in 2014, follow us on Twitter @theredcardwales to be kept up to date with our work. The match was supported by the Big Lottery and the Welsh Government. 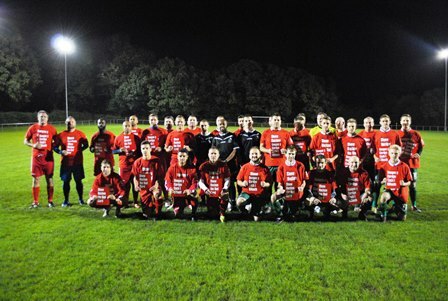 The teams were led out of the dressing rooms by officials Amin Said, John Bryant and James Burgess wearing the SRtRC campaign T-Shirt and lined up to show their support for the campaign holding up SRtRC Red cards prior to kick off. The Legends won the coin toss and kicked off the 2013 Sporting Legends match at Taffs Well FC. It was the Legends that started the game the brighter team having most of the possession and forcing the FAW to defend some early corners. The Legends continued the pressure in the opening 10 mins and got their first real chance via Aron Davies showing pace and producing some good skill down the wing beating FAW player Stuart Williams and cutting the ball back just behind Lee Trundle who would have had a simple tap in. Shortly after, Leon Jeanne had been put through on goal by a precise pass from Kevin Cooper only to be ruled offside by official John Bryant. The Legends pushed forward and got the opening goal on the 12th minute mark scored by striker Julian Alsop, Captain Lee Trundle drove with the ball into the FAW box and cut the ball across goal for Alsop to finish. The Legends continued to have good possession although the FAW team was starting to defend better and show more composure in possession of the ball creating some shots from distance. Just over 20 mins gone into the first half with the sides becoming more evenly matched, Lee Trundle picked up the ball just beyond the halfway line from a wayward FAW pass, saw the FAW keeper off his line and sensationally scored lobbying the goal keeper from distance. Legends 2 FAW 0. After the goal it was the Legends that had the momentum as Julian Alsop was brought down right on the edge of the box. Lee Trundle stepped up with a ferocious strike skimming the top of the bar. Moments later Trundle again was in good possession just outside the FAW box continuing to force pressure on and was brought down with the pressure starting to tell for the FAW defence. Lee Jarvis stepped up to this attempt with a curling shot superbly saved by the FAW keeper. On the half hour mark the FAW had their best chance from a fantastic strike from Daniel Gwyn Hughes to be parried out for a corner by Legends goal keeper Jason Trindler. The last 15 mins of the first half was largely uneventful with both teams having long spells of possession and the players looking towards the half time break. The FAW started the second half the better side with some early chances and pressure on the Legends goal. The Legends had a breakaway on goal via Alsop whose shot was well saved by the FAW keeper only to fall to Lee Trundle who slotted the Legends 3rd goal home. Legend 3 FAW 0 against the run of play. The FAW continued with their pressure to get back into the game which paid off on the hour mark with a well struck finish by Morgan Williams. Legends 3 FAW 1. The game was now equal with both teams enjoying lengthy possession periods. At the end of a good spell of possession for the Legends, former rugby star Lee Jarvis showed some good skill to shift the ball onto his right and finish around the keeper in style to make it Legends 4 FAW 1 with 10 mins left to play. The cup was looking sure to be in the hands of Captain Lee Trundle but the FAW were determined not to let it out of their hands and managed to score a late goal from a good finish by Daniel Gwyn Hughes. Legends 4 FAW 2. The Legends showed their experience and managed to maintain possession well with the crowd jeering each successful pass seeing out the clock for a 4-2 Legends win. An eventful game with 6 goals and some great phases of play on show, Lee Trundle was the key difference between the teams picking up the man of the match award. SRtRC Sporting Legends 4 Football Association of Wales 2.